With all of this snow that we have had to deal with, and so many missed days of schools, the last thing on my mind has been what to make for Savannah to bring for her Valentine's Day party. I was lucky that I remembered to buy her cards to sign and hand out, during a recent trip to buy milk and more ice melt for the ice dams on the roof and icy walkways. I know that I am not alone in feeling stressed and all over the place. Not only do the holidays seem to happen one right after the other, without a little breathing room, but as parents we have to be ready when a school event or activity notice comes home with your child, or you are reminded at the last minute that your child signed you up for 2-3 dozen cupcakes or cookies for a party they forgot all about. I wasn't planning to have to make something for Savannah's Valentine's Day party, as we were expecting snow on her planned party day, and school was cancelled. But, teachers decided to move it to this past Wednesday, leaving me to try to figure out with a day's notice what to make or pick up. I always told myself that once I had kids that I would bake and so all these fun things for school parties and events. I never factored in the tiredness I would feel caring for two little ones, and always being on the go with after school clubs or activities. My window for baking is slim to none usually. And, with the recent snow and ice dams on our roof, the kitchen is the last place I want to be tired up in unfortunately. But, I still needed to come up with a non-candy snack to send Savannah to school with. What did I go with? Well, what child (or adult for that matter -- yes, I am guilty, too!) doesn't love goldfish to snack on. I could probably find a few in the backseat of the car right now, as the girls love to snack on the when we are out and about. I received a box of 2 oz. Goldfish grab and go containers thanks to the kind folks at Pepperidge Farm, to share with my daughter's class. The box came an hour before we were to leave for school -- cutting it close, right? But, with the help of Savannah and Bella, we cut ribbons and attached the cute snack size boxes to their already signed Valentine's Day cards. And, you know what? They were a hit with the kids at school. While the kids had bags filled with candies, and a dessert table that looked like a feast, the kids quickly ripped open the Goldfish boxes and poured these cheddar snacks onto their plate. 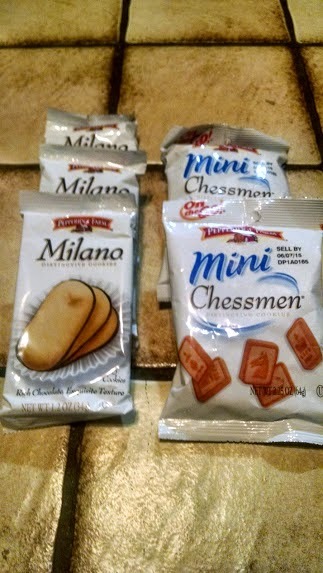 On the off chance that Grab & Go Goldfish Crackers are not a favorite of your child, why not consider picking up Single Serve Milano Cookies or even On the Go Mini Chessmen Butter Cookies to send your child to school with. Not only do these on the go snack portions make for a great lunch box treat, but kids will love seeing these alongside your child's Valentine's Day card, or at the dessert table. And, teachers will love getting some, too, to enjoy with their morning coffee, or at home, after a long day with the kids. I for one love to stock up on the Single Serve Milano Cookies, and dip them into my hot chocolate at night time. It is a nice "me time" treat for this chocoholic. So, stop stressing over what you can whip up in the kitchen tonight for tomorrow's Valentine's Day party at your child's school. Instead, drive to your local supermarket or favorite retailer, and pick up snack size servings of some of Pepperidge Farm's favorite tasty snacks. Your child's class and teachers will love them, and you will be able to spend time with the family, instead of rushing around in the kitchen trying to bake last minute -- which is never fun. 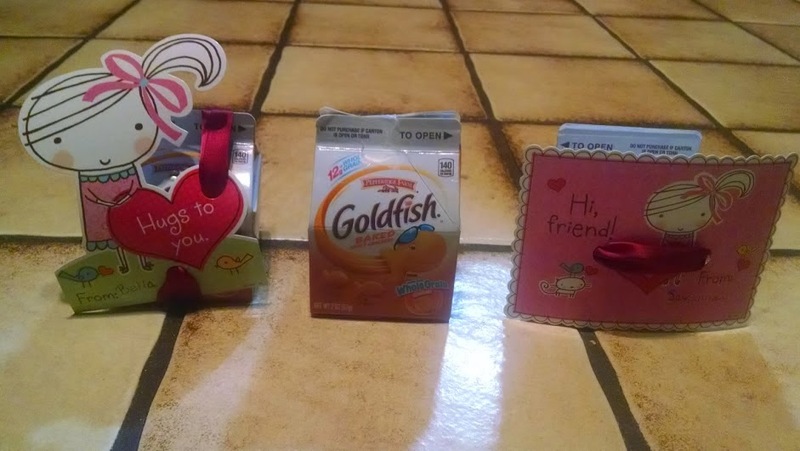 "Help your little ones show their appreciation for friends and teachers this Valentine’s Day with these tasty snack options from Pepperidge Farm. The perfect complement to those superhero, princess and cartoon V-Day cards, these single-serve items will be an instant classroom hit. 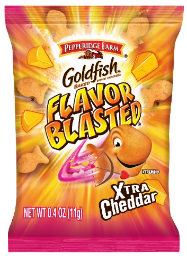 Grab & Go Goldfish Crackers: Available in Cheddar, Flavor Blasted Xtra Cheddar, Colors, Grahams Vanilla Cupcake and more, these snacks are not only delicious, but an easy way to share the love with classmates. The fun Valentine’s Day packaging is an added bonus! Single Serve Milano Cookies: The perfect treat for a classroom V-Day themed snack party. These single serve classic chocolate cookies will be a big hit. Bonus: Teachers will be sure to swoon over this Valentine’s Day treat as well. 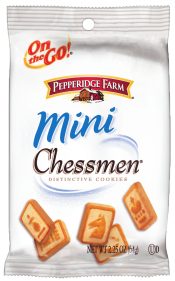 On the Go Mini Chessmen Butter Cookies: The long time favorite, available in easy to share individual packs, is a great alternative for the little ones and teachers who would love a delicious, chocolate-free treat." These are great snack ideas those Milanos look super yummy.